With the constantly increasing number of cores in high performance computing (HPC) systems, applications produce even more data that will eventually have to be stored and accessed in parallel. Applications’ I/O in HPC is performed in a layered manner; scientific applications use standardized high-level libraries and data formats like HDF\(5\) and NetCDF-\(4\) to store and manipulate data that is located inside a parallel file system. 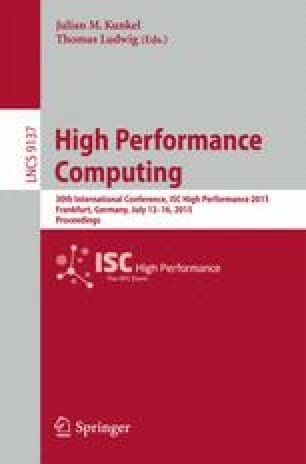 In this paper, we present a performance analysis of the parallel interfaces of HDF\(5\) and NetCDF-\(4\) using different test configurations in order to provide best practices for choosing the right I/O configuration. Our evaluation follows a breakdown approach where we examine the performance penalties of each layer. The tested configurations include: (i) different access patterns, disjoint and interleaved (ii) aligned and unaligned accesses (iii) collective and independent I/O (iv) contiguous and chunked data layout. The main observation is that using interleaved data access in a certain configuration achieves near the maximum performance. Also, we see that NetCDF-\(4\) does not provide the ability to align the access to the Lustre object boundaries. To overcome this we have developed a patch that resolves this issue and improves the performance dramatically.